Semi-rural village life, with easy access to the rest of South Bali's attractions. Balinese village life and Tanah Lot is 20 minutes' drive away. Canggu's restaurant scene has developed a lot recently and Seminyak's and Kerobkan's excellent restaurant are nearby. Fairly low-key on most nights, but happening Seminyak is only 20 min away. Kids will enjoy the green environment, and Splash Waterpark. A few good options and several private villas with spas. Greg Norman designed Nirwana golf is close by. Divers need to drive an hour or two to reach a good dive site. You can surf right off Canggu beach. Not too crowded. Although Canggu is developing you still will find the tiny village unspoilt with sleepy local life ebbing around you. Despite the virgin tranquility, stunning sunsets and lack of tourists you can still find a lively scene only 10 km down the road in the upmarket town of Seminyak. The black volcanic sands that leak into the waters of Canggu may not look as inviting as its powdery white neighbors, but are just as good for losing a day stretched out with a book under the sun. The rolling waves and strong rips can prove hazardous for swimmers, but are perfectly designed to suit extreme watersports. The beach is usually teeming with surfers seeking out that perfect ride. For those who wish to participate you can even book beginner’s lessons and take to the waves. Although developing fast, Canggu is still a very rural area where the locals use the sea as their livelihood, thus shopping facilities are limited. Yet only a short distance away you can find the hip and happening Seminyak. Here you can discover a treasure trove of designer stores and chic boutiques. Not only can you pick up intricate jewelry and handmade clothing, you can also find Indonesian antiques, contemporary art and plenty of fresh market goodies. If you are looking for fast and furious nightlife Canggu could leave you disappointed. The best way to enjoy an evening is to sit on the beach with a cold beer in hand and watch the sun sink beneath the horizon. However you can head up to The Beach House for live music and delicious sea food barbeques. If you are hoping for some late night entertainment you may have to make the trip to the late night bars of Seminyak. If you are searching out the endless summer, without the tourist crowds or bright lights of development, then Canggu will serve you well. Here you can soak up the rural landscape where the ocean stretches to meet the emerald rice paddies. Lately a large number of holiday villas have been built in the Canggu area. 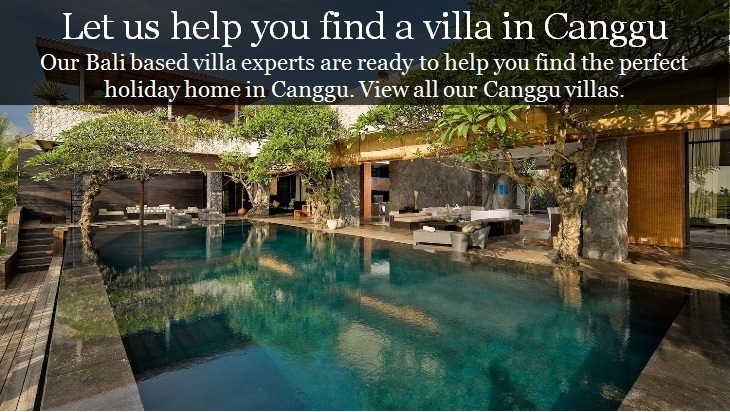 They come in all sizes and for any budget, but in general villa prices in Canggu are very reasonable compared to villas in neighboring Seminyak, so if you are travelling as a family or as a group, you should take a look at our more than 100 villas in Canggu.